LDN 1495 is the dusty reddish/brown nebula which extends from the lower left of the image to the upper right part of the image frame. It actually extends quite a bit further and this field of view is centered on the main part of the nebula. LDN 1495 is part of the Taurus molecular cloud. 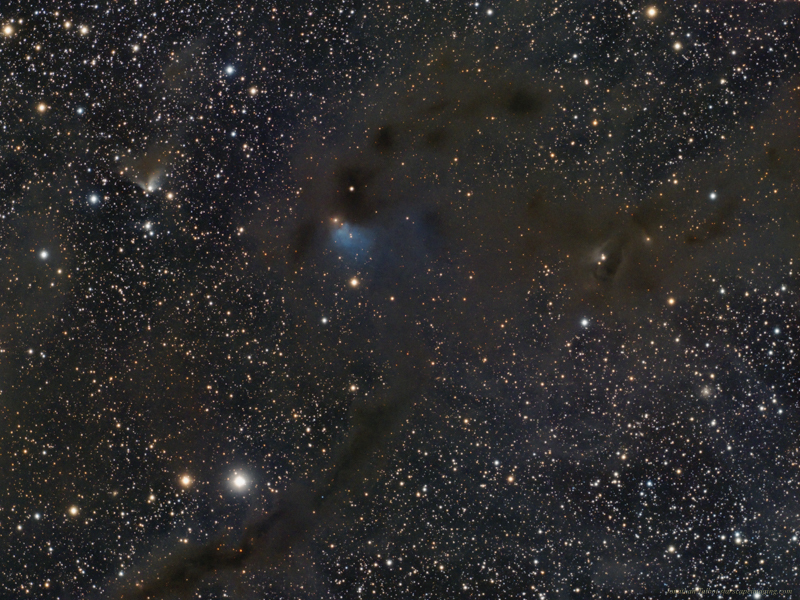 The bright blue reflection nebula near center is LBN 782 also know as Cederblad 30. Further to the left of LBN 782 is VdB 27, the white and yellowish fan shaped nebula. Near lower right is the galaxy IC 359 lying at an estimated distance of 182 million light years. Also within the image are several Barnard objects and many faint PGC galaxies. See the annotated image here to get a feel of where these object are. It took a while to collect the 20hrs of data needed to image this faint dust from my suburban back yard. I started this object on 15 Oct 18 and finished the last exposures on 5 Jan 19 using a Stellarvue SV70T 70mm refractor and my QSI 583/683 cameras. The image was processed in PixInsight 1.8.